Delicate design, suitable for house decoration, even the wedding decoration. Ideal gift for Housewarming and the other festivals, exchange gifts. ☀ MEDIUM&COLORFUL DESIGN - Medium dimension is suitable for bigger succulents or cactus growth. Colorful glaze style endues a perfect ornamental for both plants and pots. Color including Yellow, Green, Blue and Chocolate Black. 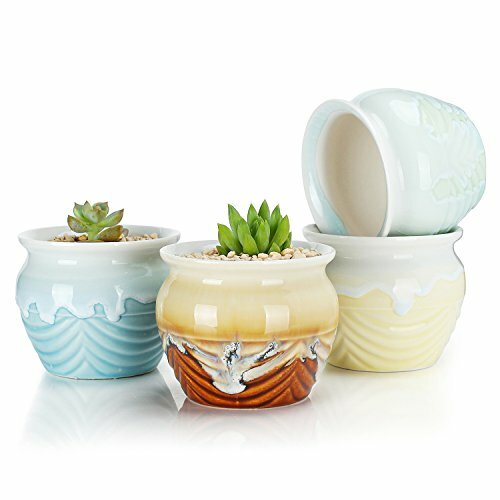 ☀ INDOOR DECORATION - These glaze exquisite flower pots are suitable for decoration in the balcony, windowsill, living room even in the office desk. ☀ MATERIAL&QUALITY - Ceramic with glaze surface. Handmade product which is made of the high quality kaolin, great quality the pots have. ☀ ATTENTION - There is a small drainage hole in the bottom. *Plant NOT Included*.